However, none of this will really have any effect on you, the listener. Blueprint 3 will still be available for public consumption, the songs will still play on the radio, and the artists under the Roc Nation umbrella, like Wale and Sauce Money, will still have the same opportunities. Sauce Money is still around? I thought Wale was signed to Interscope via Mark Ronson’s Allido Records? Sauce Money is on Roc Nation? Jay will be the billionnaire rap mogul ! 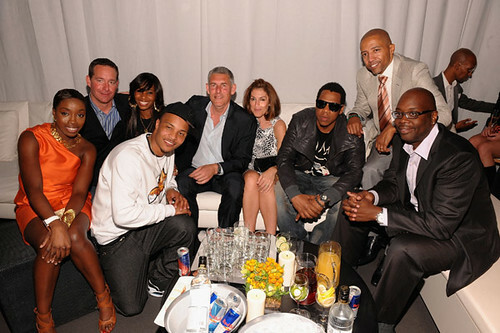 JAY-Z aka the CEO, the talent leader and da charisma spiritual emcee/rapper ! Hov knows what hes doing. Wait Sauce Money is on Roc Nation? I thought Wale just signed on RN for managemnt representation? Brandy too? But Info, you’re right…end of the day, access to the music is all that matters. But I do think its a bit of both. i thought he had a 150 million dollar deal with live nation? True bout that sauce money! He had a banger on a mixtape, on a real fly old school joint around like ’06. But would Jigga really wanna make a music group, nowadays??? everyone rippin music to death, on limewire and napster. I mean I aint by an album since years ago. Why? I can get the tracks I like for free. It better be some other type of music, like hannah montana or something or madonna, or eminem…where their fans actually buy the albums. CCN said that Jay actually made unrealeased version outta bp3 but took it back since the deal did not include a new album??? he changed it totally – wonder where the missing tracks are going? mixtapes they say – go and guess! Honestly can someone please tell me why is any of these companies giving this guy his own record label???!!!! The guy was a good rapper back in the day who sold records but that was about it. What artist has this man brought up that has gone platinum or has been significant. And please people lets not mention rhianna, The Dream, Ross, or any of the guys on the def jam roster because we all know Jay didnt bring one of them up. Lets talk bout all the bums at rockafella that never moved a disc. They are giving this guy his own label to sell his own records. Ask the Great LL if this dude deserves one. So why are you reporting this irrelevant ish in the first place? Oh wait, this “blog” is just a glorified gossip column.